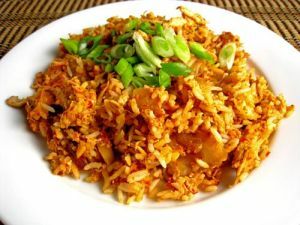 Fried Rice is a Cambodian food recipe with eggs and tomatoes. In a small bowl, beat eggs well. In a large skillet or wok, heat 1 tbsp. oil over medium heat for 1 minute. Add beaten eggs and scramble them. Place eggs on a plate and set aside. Clean skillet or wok. Heat 3 tbsp. oil over medium heat for 1 minute. Add onions, pork, and garlic and stir well. Cook, uncovered, for 2 minutes, stirring occasionally. Add tomato and green onions and cook, stirring occasionally, for 2 minutes, or until tomatoes soften. Add fish sauce, sugar, pepper, and cayenne pepper and stir well. Add rice, breaking apart any clumps. Mix well and cook, uncovered, for 6 to 8 minutes, or until heated through. Add scrambled eggs and mix well.